The police were aware of the bandh since the gram panchayats had informed them about it. Yet, it finds no mention in the affidavit submitted to the Bhima Koregaon commission. IMAGE: A protest in Mumbai, March 26, 2018, to demand action against those who instigated the violence following the Elgar Parishad in Pune on January 1, 2018. On Saturday, November 3, Bharip Bahujan Mahasangh leader Prakash Ambedkar told the Bhima Koregaon Commission of Inquiry that the sequence of events that occurred in and around Bhima Koregaon before the January 1, 2018 violence had not as yet been placed on record before the commission. Justice J N Patel who heads the two-man commission, asked Ambedkar to point out the affidavits that trace this sequence, so that those witnesses could be summoned. So far, the events of January 1 have been described only by private witnesses who have spoken about their own experience. The fact-finding report filed by witness Bhimrao Bansod, whose cross examination has already taken up nine days of the commission's time in Mumbai, does go into the background of the violence, but none of the members of the fact-finding team were themselves witness to what they reported. The correct sequence of events must come from the government. So far, no government witness has been summoned. But it appears from the affidavit filed by Ganesh More of the Pune rural police force before the commission that the police too have chosen to be selective in their narration of the sequence of events that occurred before the January 1 violence. In a conversation with Rediff.com, Ambedkar said he wanted the events in the last week of December 2017, to come on record -- the clash that took place in Vadhu Budruk village on December 29, and the January 1 bandh call given by the gram panchayats of Bhima Koregaon and nearby villages. The 21-page affidavit filed by policeman More describes in great detail the former, but makes no mention of the latter. On December 29, says More's affidavit, some villagers of Vadhu Budruk broke a recently installed signboard extolling the role of Govind Gopal Gaekwad (also known as Govind Gopal Mahar) in performing the last rites of Sambhaji Maharaj, in defiance of Mughal emperor Aurangzeb's orders. They also broke the chhatri (canopy) on top of Govind Gopal Mahar's samadhi. The incident, that was widely reported then, led to seven arrests and the filing of cases against 49 villagers, mostly Marathas, under the SC/ST Atrocities Act. But the matter was resolved in the next two days after both sides sat down togethe, and withdrew the complaints they had filed against each other. However, despite this settlement, a call for a bandh to be observed on January 1 was given by the gram panchayats in the area, including Bhima Koregaon. Appeals to support the bandh were spread through WhatsApp in which Marathas were asked to gather in large numbers on the morning of January 1 at Vadhu Budruk. Interestingly, More's affidavit talks about a 1,200-strong crowd of saffron-flag bearers gathering at 10.30 am at Vadhu Budruk on January 1. They were chanting 'prerna mantra' (inspirational mantras),' says the policeman's affidavit. More's affidavit says nothing about who these men were, and how so many of them got there, despite the elaborate police bandobast described by him. Ambedkar told Rediff.com that he was planning to bring these WhatsApp messages to the commission's notice and request that they be sent for forensic analysis in order to trace their origin. 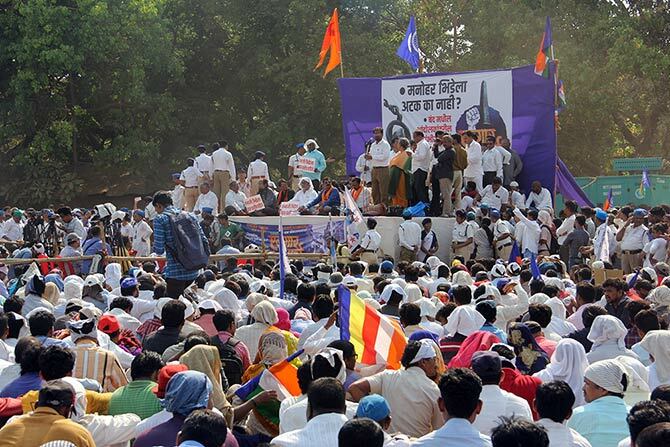 The messages describe the bandh as a protest against the filing of cases against the Marathas at Vadhu Budruk as well as the 'false history' which was being celebrated by the Dalits. The 'false history' referred to the annual homage paid by Dalits to the Vijay Stambh (victory memorial) which commemorates the defeat of the Peshwas at the hands of the British, who were helped by Mahars. That battle took place on Janaury 1, 1818. The WhatsApp messages described this as a 'black day'/ marking the end of Peshwa rule. Govind Gopal Gaekwad's role in performing Sambhaji Maharaj's last rites is also seen to be a part of 'wrong history'. The view that these two events, which hold great significance for the Dalits, are being wrongly depicted has been propagated by ex-BJP corporator Milind Ekbote, head of the Dharmveer Sambhaji Maharaj Pratishthaan. Ekbote and another Hindutva leader Sambhaji Bhide were named as responsible for the Bhima Koregaon rioting in the first FIR filed after the violence. The January 1 bandh was so successfully implemented that lakhs of Dalits who descended on the two villages found for the first time that they could not buy even a bottle of water, let alone food. The police were aware of the bandh since the gram panchayats had informed them about it. Yet, they did nothing to prevent it. Now, they seem to be bent upon suppressing the fact that it took place. Over seven pages, More describes the preparations made by the police for the expected influx of Dalits as well as the precautions taken in view of the clash at Vadhu Budruk. But not a word is mentioned about the bandh.